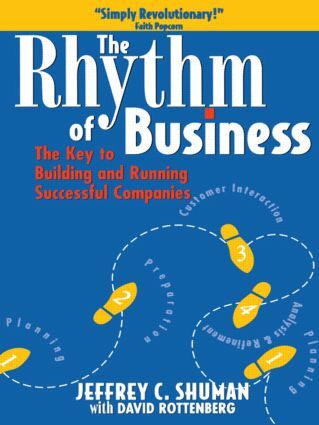 The Rhythm of Business identifies and describes the natural development process which all successful business people use intuitively when starting and running a business. Once you understand The Rhythm of Business, you will never feel lost or out of sync, no matter what business you are in, because The Rhythm of Business incorporates a process with concrete steps to attain business success applicable for any business. A lot of business books deal in `tips.' This book deals with the most fundamental principles in business. Fundamental principles might not sound interesting to someone who is trained to think in terms of the practicalities of daily business life, but, in fact, The Rhythm of Business is the most practical, down-to-earth business book you will ever read! Jeffrey C. Shuman has crafted a unique career as an entrepreneur, consultant, business professor, and author. He is considered a leading expert in the emerging field of entrepreneurial studies. His courses in entrepreneurship at Bentley College tap state-of-the-art knowledge about business creation. His writings include dozens of articles and a book on entrepreneurs and the business creation process. "I wish I had this book when I started-to help me through the stress adn the anxiety and the fear" -Judy George, founder of Domain Inc.